Choosing the right piece of furniture can be difficult even in a showroom. And often a wrong choice only becomes evident when you see the item in your own home. It may be too big, or too small, the colour may be too loud, or too subdued. You may even wish you'd chosen a different colour. Whatever the reason, if you're not delighted with your choice, you have 30 days to let us know and we'll collect the item(s) and refund your money, less any collection costs. Assuming you are happy with your choice, and assuming fair wear and tear, every item is then guaranteed for ten years against any defect of manufacture or materials. If a problem does arise you can inform us straight away. Within this guarantee period, we are able to treat your furniture as if you had purchased it locally. We usually require two repair estimates from your local repair centres and, once submitted, we are then able to assess the quotation and notify you accordingly. We manufacture to the highest standards and we carefully inspect every item before delivery. Complaints are therefore extremely rare, but if you're not entirely happy, we're sure that you'll find our concern matches yours. Should there be a fault in one of our suites or chairs, we will gladly replace the item free of charge or refund your money in full. Please remember that you have 30 days after delivery to change your mind giving you complete peace of mind! 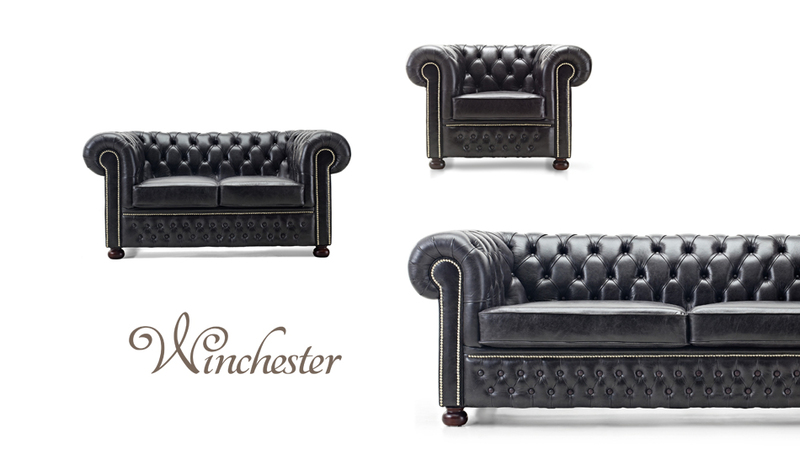 The Chelsea Chesterfield in Empire black.